and they were placed in their own genus. what has been described as gull-like plumage, with dark black backs, mantle and tails and lighter heads, underwings and bellies. mal - foolish and mok - gull. is a large seabird of the albatross family Diomedeidae. 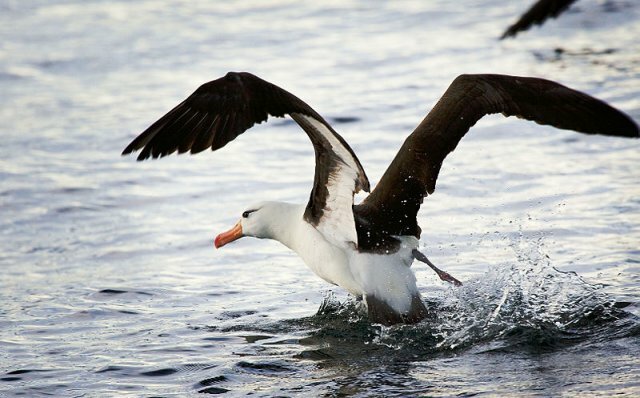 It is an endangered species on the IUCN Red List, but is the most widespread and common albatross. 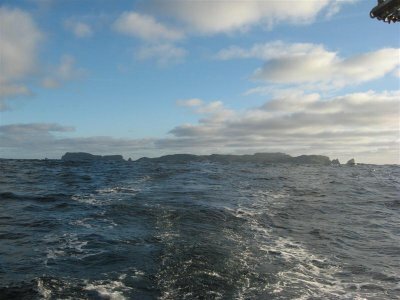 on Crozet Islands, Kerguelen Islands and Heard Island and McDonald Islands. 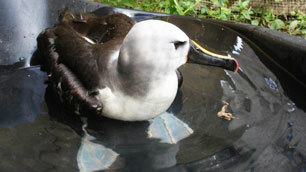 The Campbell Albatross (T. impavida) was formerly believed to be a subspecies of this species. with a 200-235 cm (79-93 in) wingspan and an average weight of 3.7 kg (8.2 lbs). dark tail band and smaller size. a broad black edging to the white underside of its wings, white head and orange bill, tipped orange. In young birds the underwings are darker, the head grey and the bill grey, tipped black. and more complete dark head markings. 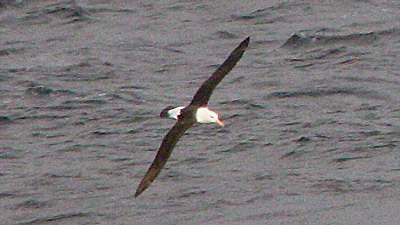 The Black-browed Albatross is circumpolar in the southern oceans. It is the most likely albatross to be found in the North Atlantic due to a northerly migratory tendency. in Scottish Gannet colonies (Bass Rock, Hermaness and now Sula Sgeir) for a number of years. Ornithologists believe that it was the same bird, known as Albert, who lives in north Scotland. and it is suspected that the bird is over 47 years old. for the past 40 years. 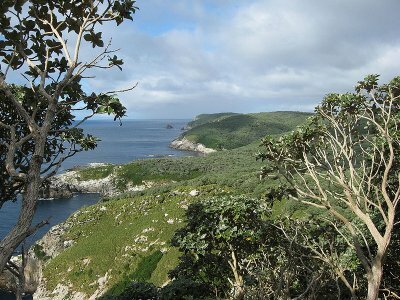 where a Black-browed Albatross lived among the gannets for over 30 years. (Faroese language: súlukongur) in Faroese. 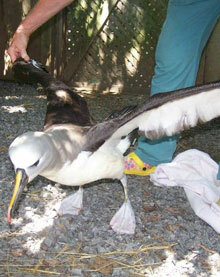 This bird is a 90 cm medium-sized, black-and-white albatross with dark thumbmark at base of leading edge of underwing. Adult has dark grey crown, face and throat. Dark grey upper mantle. Grey-black back, upperwing and tail. White rump. White underparts with black thumbmark, narrow leading and trailing wing edges, and wing tip. Yellow bill with dark spot at tip of lower mandible. Salvin's Albatross T. salvini has a smaller, darker bill and silver-grey cap. 1999-2003 and in 2007 revealed c.5,300 occupied sites. Eggs are laid September-October, hatching November-December and fledging in March-April. The earliest recorded breeding age is seven years, but birds return to the colony at the age of four. The diet has not been well studied but it is thought to feed mostly on cephalopods and fish. 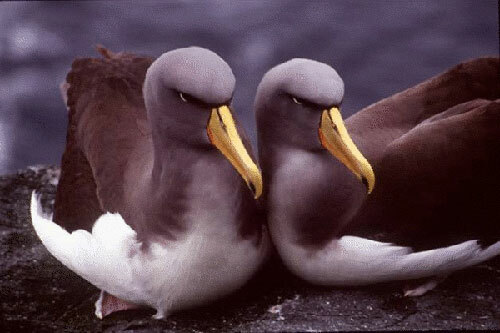 Chatham Albatrosses: no longer Criticilly Endangered? 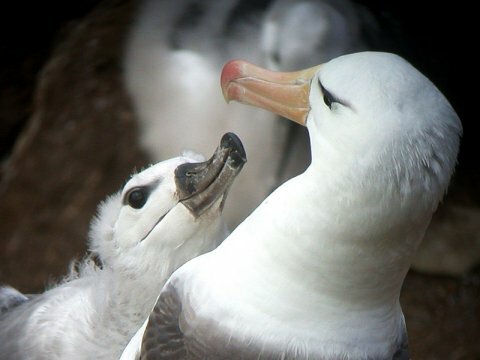 incubating and with a young chick in different years on Toru Islet in the Western Chain. 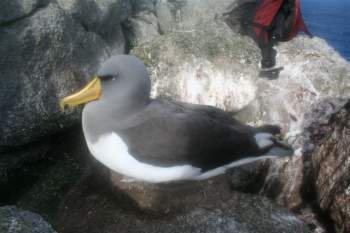 A Chatham Albatross was photographed incubating an egg on the western face of Rima Islet on 13 October 2008. In the same month a Chatham Albatross was observed incubating on Toru Islet, with at least three other birds present. incubating an egg on Toru. Its partner was confirmed as a Salvin's Albatross. Incubating Chatham Albatross on Rima Islet, Snares. as well as the somewhat isolated Western Chain Islands approx 5 km (3.1 mi) to the WSW. 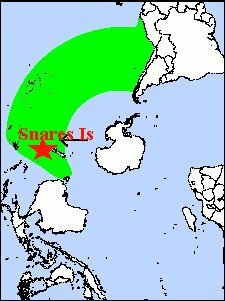 As a group of islands, the Snares cover a total of approximately 3.5 km2 (1.35 sq mi). breeding season (November-April). A dangerous reef (Seal Reef) lies ten kilometres to the south of the group. Megaherb communities grow on the islands. 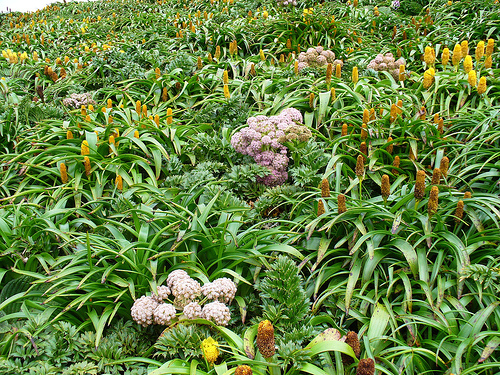 A megaherb community on Campbell Island, one of the sub-Antarctic islands of New Zealand. while the pink flowers are those of the Campbell Island Carrot, Anisotome latifolia. Some flower clusters can be up to 60 cm wide and 1,5m tall. The Grey-headed Albatross, Thalassarche chrysostoma, also known as the Grey-headed Mollymawk, is a large seabird from the albatross family. 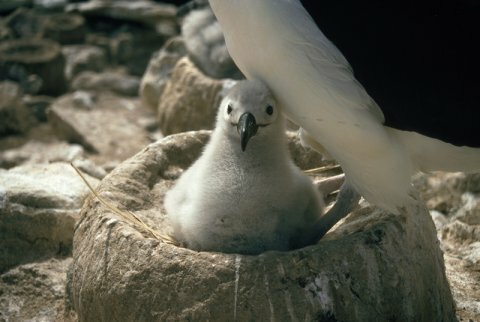 It has a circumpolar distribution, nesting on isolated islands in the Southern Ocean and feeding at high latitudes, further south than any of the other mollymawks. Its name derives from its ashy-grey head, throat and upper neck. The meaning of the name chrysostoma is derived from two Greek words. Khrusos' means gold and stoma means the mouth, in reference to its golden bill. 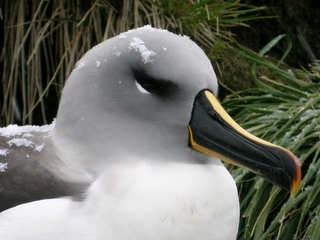 The Grey-headed Albatross averages 81 cm (32 in) in length and 2.2 m (7.2 ft) in wingspan. Weight can range from 2.8 to 4.4 kg (6.2 to 9.7 lb), with a mean mass of 3.65 kg (8.0 lb). It has a dark ashy-grey head, throat, and upper neck, and its upper wings, mantle, and tail, are almost black. It has a white rump, underparts, and a white crescent behind its eyes. Its bill is black, with bright yellow upper and lower ridges, thatt shades to pink-orange at the tip. The Atlantic Yellow-nosed Albatross, Thalassarche chlororhynchos, is a large seabird in the albatross family. 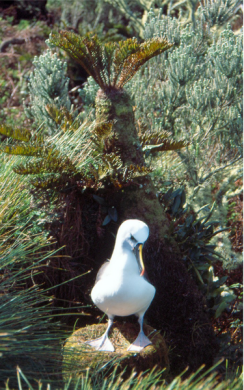 This small mollymawk was once considered conspecific with the Indian Yellow-nosed Albatross. 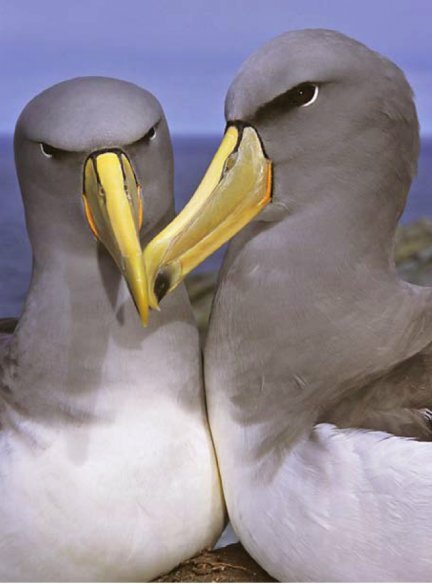 The Atlantic Yellow-nosed Albatross averages 81 cm (32 in) in length. and its nape and hindneck are white. Its bill is black with a yellow culmenicorn and a pink tip. black markings around the edge of the underwing. black borders to the underwing. This mollymawk feeds on squid, fish and crustacea. to lay their one egg in. They do this in September or early October, and the chick fledges in late March to April. (Inaccessible Island, Middle Island, Nightingale Island, Stoltenhoff Island) and Gough Island. 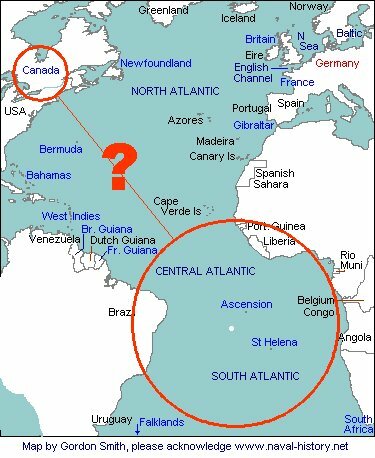 At sea they range across the south Atlantic from South America to Africa between 15° S and 45° S.
to an unusual visitor, as Alby the yellow-nosed albatross is being shipped off to Boston. For the last month, a caregiver at the Sandy Pines Wildlife Centre in Napanee, Ont., has been nursing Alby back to health while experts scratched their heads over how he managed to get so far off course. 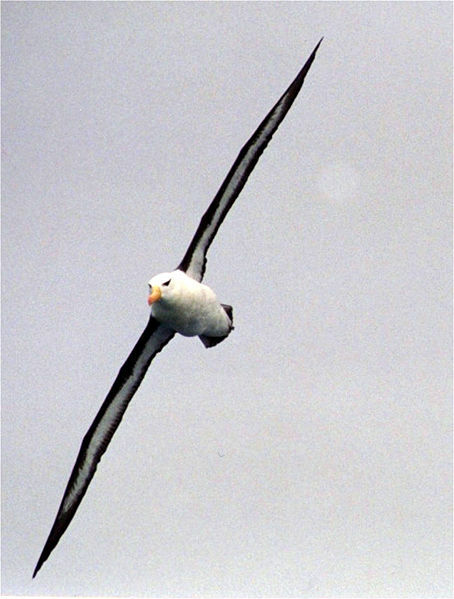 This type of albatross is usually found only in the Southern Hemisphere. When Alby arrived at the wildlife centre he weighed only half his normal weight. Notice the typical yellow nose! weighing only half of his normal two or three kilograms. heal before returning to his native South Africa. The IUCN list this species as Endangered, with an occurrence range of 16,800,000 km2 (6,500,000 sq mi) and a breeding range of 80 km2 (31 sq mi). for the total between 55,000 and 83,200 total adult birds. This population estimate was done in 1983, however and is outdated. The largest threat is from longline fishing, as harvesting of chicks and adults has been outlawed.